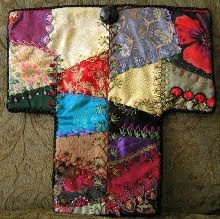 In SharonB's Stitch Explorer 2009, the featured stitch for March 15 was the trellis stitch. Although this post is about the Raised Cup Stitch, not the trellis stitch, the directions are similar - only the beginning differs. This is one of my favorite stitches, and I wanted to share it with you. 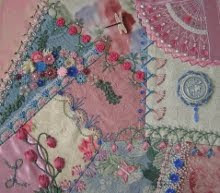 My stitch diagrams were originally for use with silk ribbon, since that is one of my favorite ways to do this stitch. 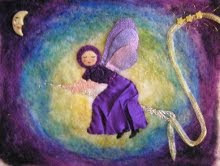 In the photos, I am using a chenille fiber. It's good to use a fiber that is not easily split. For each step, first I show the drawn diagram, then the photo(s) of the actual stitching. 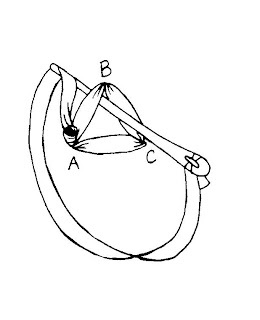 1) You begin by making 3 straight stitches to form a triangle. In the photo above, the black dot represents A in the stitch diagram above. 2) In the photo above, I have changed to yellow thread to make it easier to see. But normally you bring your same thread up at one corner of the triangle, and switch to a tapestry needle. 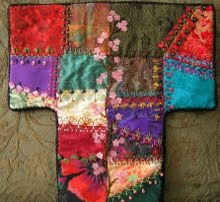 All future stitching is done without piercing the fabric, until the flower is complete. Slide your needle under one of the straight stitches and bring the thread over, then under the needle. 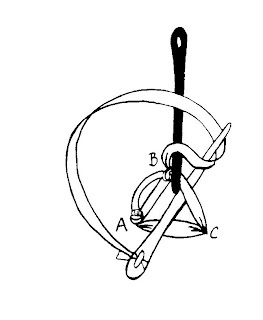 Pull tight to form a knot. 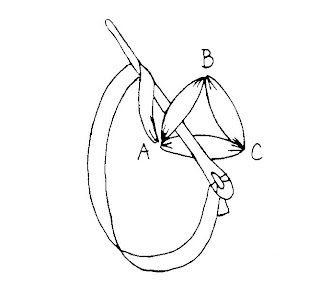 This knot should be snugged down near the corner of the triangle where you first brought your needle up (A in the diagram). 3) Slide your needle once again under the same backstitch and bring your thread over and under the needle. Pull the needle through and form a knot close to the other end of this backstitch. 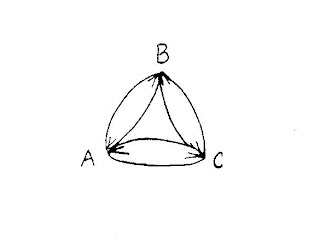 Now the first side of your triangle has two knots on it, with a bar connecting them. 4) Slide your needle under the next backstitch and form a knot. This knot will be very close to the previous knot, making the bar between them very short. In the stitch diagram, you can see a black needle placed there to make sure that there will be a bar (however small). Slide your needle under this backstitch again and make a second knot. Now there are four knots and 3 bars connecting them: a long, a short and a long. See the stitch diagram below. 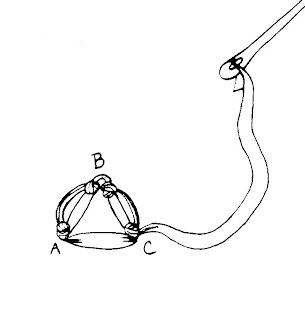 5) Now form two knots on the last backstitch, being careful to have a bar, however small, when you go around the corner. Now you have six knots and five bars, three long and two short. 6) Now slide your needle under the bar you formed on the first backstitch and make a knot. I switched to grey thread to help you see, but you would continue around as shown in the diagram above. 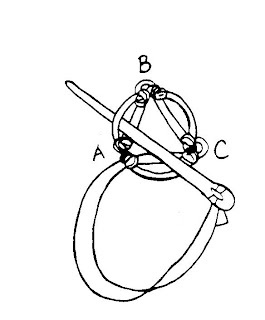 7) In the photo above, I have continued around, forming 2 knots on the long bars and only one knot on the short bars. I have gone almost all the way around with the grey. Once you are happy with the flower, you can end your thread by weaving it vertically in and out of your stitching and piercing the fabric near your triangle of backstitches. The following photos show how the flower comes out when finished. A bead in the center is a nice touch. Looks good, sounds easy the way you have shown, so I'll give it a try later. It should work well for a daffodil. I'm keen to get a nice trumpet. Thanks for sharing. Thanks for the detailed tutorial, I think I will give it a try. Cute and Lovely Cup.Hope my trial comes out as good as yours. Thank you for these explanations. Very easy to follow. Very cool and great detail shots! I need this! Thanks for sharing!! 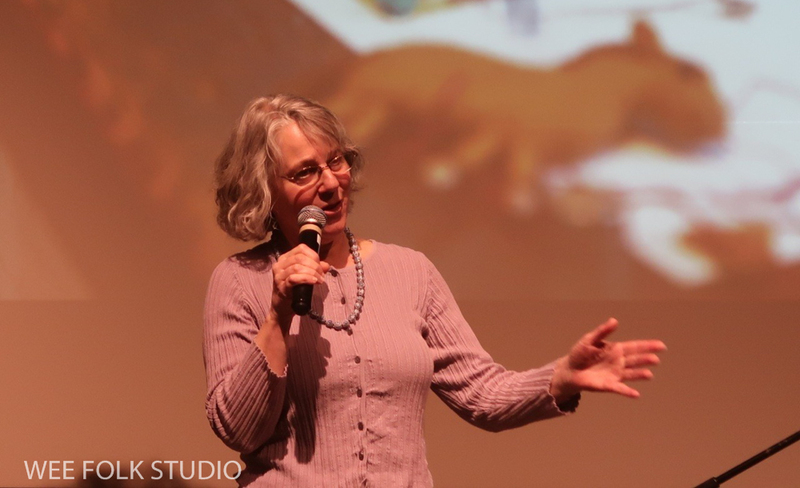 Thanks for sharing this nead little stitch -- love and and appreciate your sharing of it. Nice, easy to follow tutorial - now I know how I did it all wrong! Thank you for sharing. 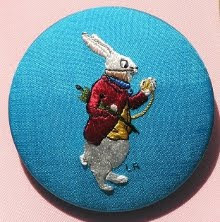 I have not done any embroidery for 35 years, and am just re-acquainting myself. I have been trying to learn this stitch for ages, your instructions make it seem "do-able"....I'm going to try again.